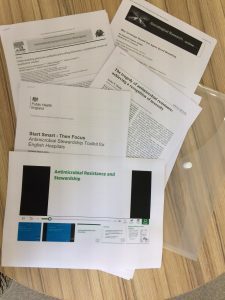 In March 2017 I travelled down to Bristol for a two day meeting on interdisciplinary research into antimicrobial resistance (AMR), organised by Helen Lambert (ESRC AMR Research Champion) , University of Bristol. Around 50 researchers had come together for the workshop, and they were a diverse group – over coffee and dinner I spoke to lab-based researchers, economists, psychologists, sociologists, and clinical researchers. All were working on, or were interested in, infection, antibiotic use, and antimicrobial resistance, but all were looking at the problem in different ways. The workshop was part of an ongoing investment in an ambitious cross- research council initiative which has been running since 2015, with the aim of creating an infrastructure for interdisciplinary research into AMR. Interdisciplinary research is becoming ubiquitous, but why is interdisciplinary research particularly important in the case of AMR? Antibiotic resistance is one of the pressing problems of our age, and a global risk. Through exposure to antibiotics bacteria can develop resistance, meaning that antibiotics that were previously effective in treating infections will no longer work. Some have predicted a catastrophic future scenario where people will be at risk of dying from even minor injuries and infections because we can no longer call on antibiotics to treat them. There is no simple answer to the problem. Although scientific research into new ways of treating infection and better diagnostic tests will make an important contribution, the proliferation of antibiotic resistance is as much a social as a technical problem – it’s down to the ways we use (and over-use) antibiotics. Because behaviour around antibiotic use is so important for controlling the spread of resistance, social scientists have an important role to play, working alongside scientists, clinicians, and policymakers to better understand the nature of the problem and find ways to intervene. Interdisciplinary approaches to research offer exciting possibilities for novel solutions, but can also pose significant challenges, not least navigating the political, emotional, and practical aspects of working in interdisciplinary teams. 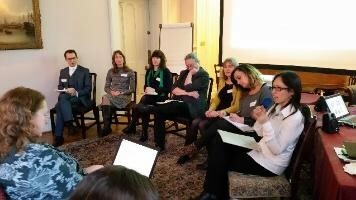 The ESRC workshop was a valuable opportunity to reflect on these benefits and challenges in the context of work on infection control and AMR. Among those presenting were Henry Buller and Kristen Reyher (Universities of Bristol and Exeter), who are working on interdisciplinary projects on antibiotic use in farming and who emphasised the challenges of developing a shared vocabulary, and the importance of engaging the wider community of farmers in their research. Marco Haenssgen (University of Oxford) drew on his experience as a social scientist of working on interdisciplinary research on AMR in India, China, and Thailand to highlight the challenges arising from people working within different paradigms and with different objectives, assumptions and expectations, but also to emphasise the value of interdisciplinary research in tackling problems more holistically, and not losing sight of the ‘big picture’. What also became apparent, but is perhaps less often discussed, is the challenge of forming interdisciplinary teams in the first place. How do we meet people we might need to work with? How do we overcome our suspicions of others who may speak a different ‘language?’ We need more opportunities to meet and talk to others outside of our discipline. In my work I rarely come across farmers or vets, but from talking to researchers in these fields during the workshop I now understand much more about the range of stakeholders in this global problem, and appreciate the value of an integrative ‘One Health’ approach. We need to know who the important people for us to talk to and work with are, and have the opportunity to build some level of familiarity and trust, which are critical elements for the start of a good working relationship. The presentations and discussions resonated with my own experience of working on the interdisciplinary project: ‘Antimicrobial resistance as a social dilemma’. The project involves social scientists from different disciplines and methodological backgrounds, along with clinicians in microbiology/infection control, and this has thrown up both benefits and challenges. First the positives: the big benefit of interdisciplinary working is the stimulation of new ways of thinking. Clearly, there are potential benefits from using social science theory to help us understand how to tackle the important but seemingly intractable problem of AMR. But as social scientists, working on a new, applied problem also brings opportunities to develop within our disciplines. One of my co-investigators is particularly excited about how working on AMR will help take things forward in his field; he feels he would not have thought about working on AMR if we had not put together this interdisciplinary team. The clinician role in our project is critical, and the social scientists in the group have learned a lot from the clinicians. As social scientists we can theorise but we don’t have that insight into important aspects of day-to-day clinical practice – the decisions that have to be made, the risks that have to be balanced, the challenges that arise, and the way that behaviour is shaped by the context in which they practice. This insight is so critical in ensuring that theorising is anchored in the realities of the clinical world. But it hasn’t all been plain sailing! I’ve found there are different expectations in the team of the goals of the research and what the outputs might be. Perhaps not unexpectedly, the clinicians are more interested in interventions – they want to know what can be done differently to optimise prescribing. The academic social scientists have a strong slant towards theory development, but different theoretical perspectives can pull the research in different directions. Within this project we’ll need to keep the dialogue going about expectations goals, and end outputs from this particular project. But at the same time, as it’s a pump priming grant, we’re keen to explore how we can develop ideas for future research together. At our second meeting, one of the team bravely admitted that they didn’t understand anything about agent-based modelling, an approach we plan to use in the project. We all recognised similar gaps in our knowledge and expressed anxieties about this – some team members didn’t really understand qualitative research methods, or how antibiotic resistance comes about. I’ve reassured the team that the value of interdisciplinary research is that everyone brings different and valuable expertise and perspectives to the problem. We don’t all need to be experts in everything, instead we need to recognise where we each are experts, and be aware of the extent and limits of our knowledge. But, if we’re going to able to bring these different perspectives together we all need some level of shared understanding to orient towards the problem. My ‘crib sheet’ folder of key, accessible resources, which has been shared with the team, is one way of trying to help us develop this shared understanding. What’s also helpful is having someone who can act as a lynchpin – with a broad level of understanding of the different disciplines or perspectives, and with the interactional expertise to orchestrate cooperation between people from different worlds. I’m cognisant of the need for me to play that role; as project lead, managing relationships and interactions within the team will be as important as project management. We’ve also faced practical challenges of getting the team together for a meeting – so far our meeting plans have been disrupted by a Tube strike, Storm Doris, and the need to avoid the Sri Lankan monsoon season! Perhaps the strongest message that I took away from the workshop and from beginning work on our project is that tackling antimicrobial resistance will be impossible without interdisciplinary research, but we also need to recognise that we have to work hard at building strong cooperative relationships and maintaining open communication in order to help make it work.